Dwarves are a stoic but stern race, ensconced in cities carved from the hearts of mountains and fiercely determined to repel the depredations of savage races like orcs and goblins. More than any other race, dwarves have acquired a reputation as dour and humorless artisans of the earth. It could be said that their history shapes the dark disposition of many dwarves, for they reside in high mountains and dangerous realms below the earth, constantly at war with giants, goblins, and other such horrors. Dwarves are lovers of history and tradition, and their long lifespan leads to far less in the way of generational shifts in attitudes, styles, fashions, and trends than shorter-lived races exhibit. If a thing is not broken, they do not fix it or change it; and if it is broken, they fix it rather than replace it. Thrifty as a rule, dwarves are loath to discard anything unless it is truly ruined and unable to be fixed. At the same time, dwarves’ meticulous, near-obsessive attention to detail and durability in their craftsmanship makes that a rare occurrence, as the things they make are built to last. As a result, buildings, artwork, tools, housewares, garments, weapons, and virtually everything else made by dwarves still sees regular use at an age when such items would be relegated to museum pieces, dusty antique shelves, or junkyard fodder by other races. Taken together, these traits create the impression that dwarves are a race frozen in time. Nothing could be further from the truth, however, as dwarves are both thoughtful and imaginative, willing to experiment, if always keen to refine and perfect a new technique or product before moving on to the next one. Dwarves have achieved feats of metallurgy, stonework, and engineering that have consistently outpaced the technological advances of other races, though some non-dwarven races have used magic to supplement and perfect their own creations to achieve the same ends through mystical rather than mundane means. They are also a race typified by stubborn courage and dedication to seeing tasks through to completion, whatever the risks. These traits have led dwarves to explore and settle in extreme environments that would cause other races to quail and retreat. From the darkest depths of the underworld to the highest mountain peaks, from rusting iron citadels along desolate rocky coasts to squat jungle ziggurats, dwarves have established their enclaves and redoubts, holding them against all comers or perishing to the last and leaving only their enduring monuments to stand as their legacy. While it is said that dwarves are not venturesome or inventive, it would be more accurate to say that they maintain a focus on and dedication to each task they undertake and every change they adopt, vetting such changes thoroughly before adopting them wholeheartedly. When faced with new circumstances and new needs, they react by applying tried and true tools and techniques systematically, using existing methods whenever possible rather than trying to invent novel solutions for every situation. If necessity requires, however, they throw themselves with equal vigor into developing the next perfect procedure for demolishing the obstacles that get in their way. Once their desired goal is obtained, they focus on consolidating each new piece of territory or conceptual advance. Dwarves thus rarely overextend themselves, but they also may miss opportunities to seize the initiative and maximize the advantages they create. Physical Description: Dwarves are a short and stocky race, and stand about a foot shorter than most humans, with wide, compact bodies that account for their burly appearance. Male and female dwarves pride themselves on the long length of their hair, and men often decorate their beards with a variety of clasps and intricate braids. Clean-shavenness on a male dwarf is a sure sign of madness, or worse—no one familiar with their race trusts a beardless dwarven man. Relations: Dwarves and orcs have long dwelt in proximity to one another, and share a history of violence as old as both races. Dwarves generally distrust and shun half-orcs. They find elves, gnomes, and halflings to be too frail, flighty, or “pretty” to be worthy of proper respect. It is with humans that dwarves share the strongest link, for humans’ industrious nature and hearty appetites come closest to matching those of the dwarven ideal. Alignment and Religion: Dwarves are driven by honor and tradition. While they are often stereotyped as standoffish, they have a strong sense of friendship and justice, and those who win their trust understand that while they work hard, they play even harder—especially when good ale is involved. Most dwarves are lawful good. Adventurers: Although dwarven adventurers are rare compared to humans, they can be found in most regions of the world. Dwarves often leave the confines of their redoubts to seek glory for their clans, to find wealth with which to enrich the fortress-homes of their birth, or to reclaim fallen dwarven citadels from racial enemies. Dwarven warfare is often characterized by tunnel fighting and melee combat, and as such most dwarves tend toward classes such as fighters and barbarians. Male 3 ft. 9 in. +2d4 in. Female 3 ft. 7 in. +2d4 in. Ability Score Modifiers: Dwarves are both tough and wise, but also a bit gruff. They gain +2 Constitution, +2 Wisdom, and –2 Charisma. Ancient Enmity: Dwarves have long been in conflict with elves, especially the hated drow. Dwarves with this racial trait receive a +1 racial bonus on attack rolls against humanoid creatures of the elf subtype. This racial trait replaces hatred. Craftsman: Dwarves are known for their superior craftsmanship when it comes to metallurgy and stonework. Dwarves with this racial trait receive a +2 racial bonus on all Craft or Profession checks related to metal or stone. This racial trait replaces greed. Lorekeeper: Dwarves keep extensive records about their history and the world around them. Dwarves with this racial trait receive a +2 racial bonus on Knowledge (history) checks that pertain to dwarves or their enemies. They can make such skill checks untrained. This racial trait replaces greed. 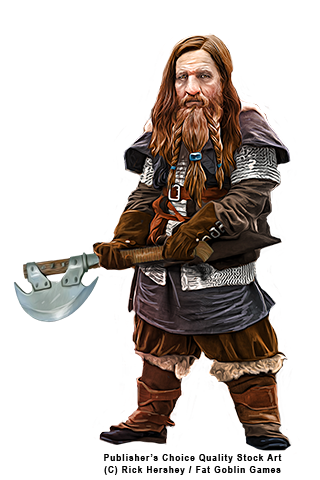 Magic Resistant: Some of the older dwarven clans are particularly resistant to magic. Dwarves with this racial trait gain spell resistance equal to 5 + their character level. This resistance can be lowered for 1 round as a standard action. Dwarves with this racial trait take a –2 penalty on all concentration checks made in relation to arcane spells. This racial trait replaces hardy. Minesight: Dwarves with this racial trait increase the range of their darkvision to 90 feet; however, they are automatically dazzled in bright light and take a –2 penalty on saving throws against effects with the light descriptor. This racial trait replaces darkvision. Stonesinger: Some dwarves’ affinity for the earth grants them greater powers. Dwarves with this racial trait are treated as one level higher when casting spells with the earth descriptor or using granted powers of the Earth domain, the bloodline powers of the deep earth bloodline or earth elemental bloodline, and revelations of the oracle’s stone mystery. This ability does not give them early access to level-based powers; it only affects the powers they could use without this ability. This racial trait replaces stonecunning. Stubborn: Dwarves are renowned for their stubbornness. Dwarves with this racial trait receive a +2 racial bonus on Will saves to resist spells and spell-like abilities of the enchantment (charm) and enchantment (compulsion) schools. In addition, if they fail such a save, they receive another save 1 round later to prematurely end the effect (assuming it has a duration greater than 1 round). This second save is made at the same DC as the first. If the dwarf has a similar ability from another source (such as a rogue’s slippery mind), he can only use one of these abilities per round, but he can try the other on the second round if the first reroll ability fails. This racial trait replaces hardy. Xenophobic: Isolationist dwarves despise non-dwarven humanoids. They speak only Dwarven and do not gain any bonus languages from possessing a high Intelligence score. In addition, they learn only one language per 2 ranks of Linguistics they possess. However, their untrusting nature gives them a +1 bonus against mind-affecting effects, except for fear affects. This racial trait replaces a dwarf’s normal languages. Deep Delver: Dwarves living far below the earth have the minesight and deep warrior racial traits. Deep delver spellcasters may exchange stonecunning for the stonesinger trait. Elder Dwarf: Traditionalist dwarves of ancient lineage have the ancient enmity, lorekeeper, and either the magic resistant or stubborn racial traits. Exiled Dwarf: Dwarves who have lost their homelands usually have the relentless and stubborn racial traits, and often have wyrmscourged as well. Mountain Dwarf: Dwarves living atop high peaks have the mountaineer racial trait and often surface survivalist as well. Mountain dwarves are also trained to defend their homes, and may take the sky sentinel and xenophobic traits instead. Alchemist: Add +1/4 to the alchemist’s natural armor bonus when using his mutagen. Cavalier: Add +1/2 to the cavalier’s bonus to damage against targets of his challenge. Druid: Select one domain power granted at 1st level that is normally usable a number of times per day equal to 3 + the druid’s Wisdom modifier. The druid adds +1/2 to the number of uses per day of that domain power. Fighter: Add +1 to the Fighter’s CMD when resisting a bull rush or trip. Inquisitor: Add +1/2 to the inquisitor’s level for the purpose of determining the effects of one type of judgment. The elf favored class bonus for kineticists mentions it applies when elemental overflow applies, but the dwarf and half-orc do not. Should they also apply only when elemental overflow applies? Yes, they should both apply only when elemental overflow applies, like the elf favored class bonus. This will be reflected in the next errata. Monk: Reduce the Hardness of any object made of clay, stone, or metal by 1 whenever the object is struck by the monk’s unarmed strike (minimum of 0). Oracle: Reduce the penalty for not being proficient with one weapon by 1. When the nonproficiency penalty for a weapon becomes 0 because of this ability, the oracle is treated as having the appropriate Martial or Exotic Weapon Proficiency feat with that weapon. Rogue: Add a +1/2 bonus on Disable Device checks regarding stone traps and a +1/2 bonus to trap sense regarding stone traps. Summoner: Add a +1/4 natural armor bonus to the AC of the summoner’s eidolon. The following feats are available to a dwarf character who meets the prerequisites.